Size is 18"x 24" including a 1" white border. 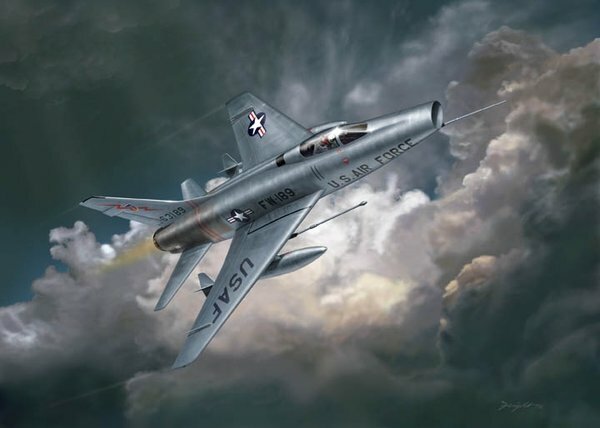 Designed and built by the same team that produced the legendary P-51 Mustang and the F-86 Sabre of Korean War fame, the North American F-100 Super Sabre was the first aircraft of the U.S. Air Force "Century Series" of fighters. Entering service in 1954, the "Hun" was the first USAF aircraft to reach Mach 1 in level flight and set a world speed record in 1955. After some early problems and redesign work, the final version proved it's worth in Vietnam as a ground attack platform. At it's peak, the F-100 equipped 16 full USAF wings and assumed the fighter-bomber role as newer, faster interceptors became available. The last F-100s remained operational until 1972 and continued in service with Air Guard units for several years more.